The Alberta Sand and Gravel Association Annual General Meeting brings together industry representatives from across the province for an agenda on topics such as resource management, health & safety, the environment, policy, general interest and industry updates. This two-day event presents a unique opportunity for companies and industry professionals to connect and promote their business and ideas. With that in mind, the ASGA is offering a select number of sponsorship opportunities and exhibit space at our 2016 AGM and Tradeshow to provide members exposure and valuable networking. Please note that event programming is still in development; updates will be posted to our website as they occur. The AGM 2016 Tradeshow is now sold out! If you are interested in becoming a sponsor or exhibitor at our 2016 AGM, please download and review the information package provided above. Completed forms can be returned to laurenwozny@asga.ab.ca. 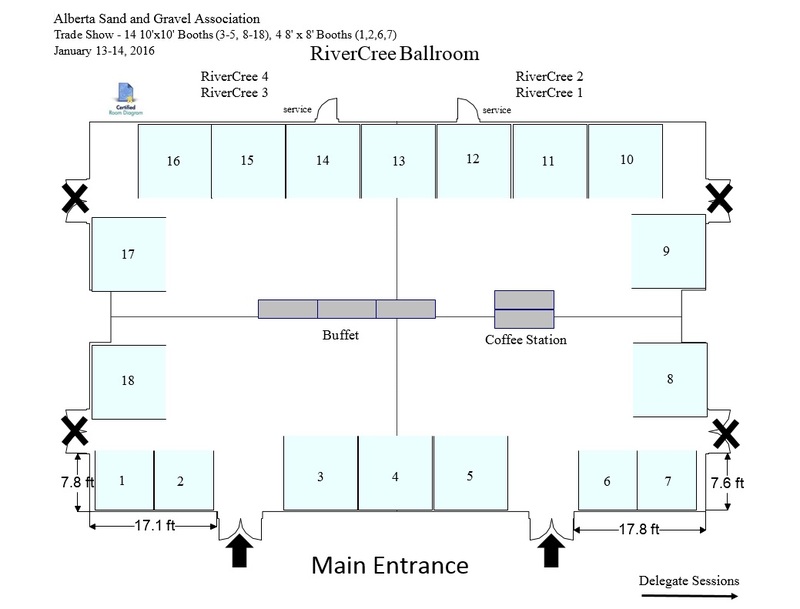 Those wishing to reserve a booth at the AGM tradeshow must include their first and second choice booth locations as identified on the Tradeshow Layout. Please note that booths and sponsorship spots are reserved on a first come, first served basis.